Our cooing, gurgling, once-upon-a-time infant is now a walking, talking, babbling, singing, dancing catch-me-if-you-can toddler. And to celebrate this occasion, we’re having a party! Now comes the big question of gifts. 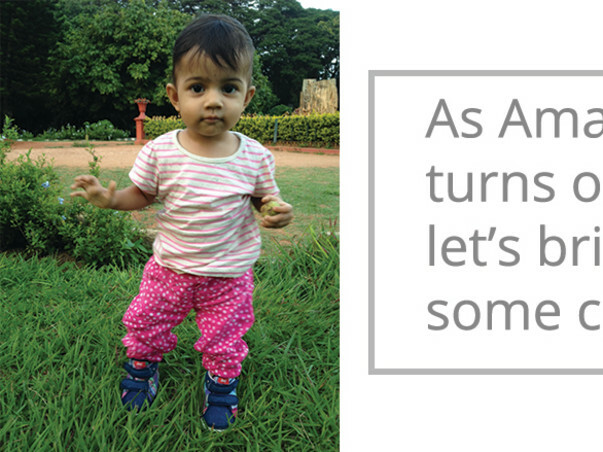 If Amaaya could articulate well enough, she’d probably ask for a big cardboard box and a bowl of curd, and maybe a kilo of raisins and pomegranate which currently are her absolute favourite foods. Books, toys? Nah, she’d rather just play with the boxes or the wrapping they come in. Also, we thought, let’s mark the occasion by making it more meaningful, by helping sponsoring education for some children in an orphanage. So I’m hoping to raise funds for Sneha Nilaya, an orphanage on Richmond Road in Bangalore, and ensure that we do our bit for some orphan children. We’ve been lucky to have been born into great families, have access to great opportunities and make our choices. Some kids aren’t so lucky, so we thought here’s our bit to do a little for them. 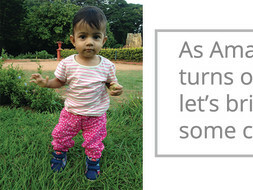 So here’s a request, if you’re thinking of bringing a gift for Amaaya, please consider making a donation instead. If you’re not thinking of bringing a gift, we love you, and thank you for being considerate. We are hoping to sponsor education cost for one year (Rs 15,000 inclusding tuition, books, uniforms, shoes) for at least one child, and two if possible. Sneha Nilaya - started in 1996 by Franciscan Sisters of the Immaculate Society, shelters orphans and poor from slums around Bangalore. From a home started with just one baby girl Sneha Nilaya now shelters sixty girls aging from five to nineteen years. In addition to providing these kids with the security of a loving home, this organization also empowers them with education and vocational training. The kids also excel in extra-curricular activities such as arts, sports, gardening and cooking. Amaaya, Sumanth and I will personally visit Sneha Nilaya in the next four weeks and hand over the contribution. I’d be more than happy to share photos of the place if you’re interested. We're hoping to sponsor one child's education expenses fully for one year, and partially, if not fully, for one more. What's more, we will also know the name of the two children and get to meet them. Wish you a very Happy Birthday, Amaaya! You're doing something wonderful on your first birthday. Wish you many such birthdays, where you make a difference in the world. Celebrating Amaaya's first birthday and wishing her many happy returns of the day!